If you need a trunk manifold system, then you've come to the right place. 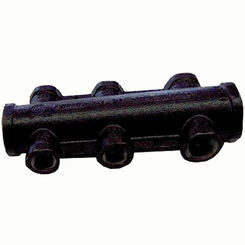 PlumbersStock offers the best prices on manifold systems, and that includes trunk manifolds and parts. Get your plumbing or heating and cooling applications operating at full steam. 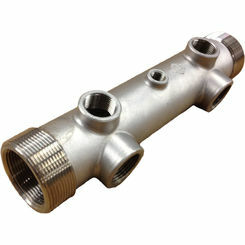 With a variety of uses, trunk manifolds can be very helpful in many home improvement projects. If you are uncertain about what part you may need, do not hesitate to contact us. 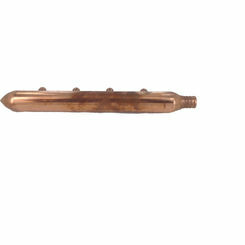 Save on trunk manifold parts by WARDFLEX and more. What Is a Trunk Manifold System? Adding a manifold (the core with lines that branch off) to any plumbing or HVAC layout can work to save water and energy because you eliminate the majority of the pipes between the water heater and the faucet. Trunk and branch plumbing layouts (T&B) use a main trunk manifold with various branches that supplies lines of water to specific fixtures via copper, iron, and rigid pipe. Each branch line generally serves 1-3 close outlets, such as the toilet, tub, and sink in a bathroom. While a good and easy layout to use for supplying water, it’s not ideal for on-demand water needs and tends to waste more water than other layouts. 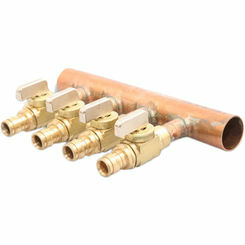 Another layout that can be used is known as the PEX Manifold plumbing layout. Similar to the T&B layout, this layout uses a single trunk line that leads to a manifold that sends a branch line to a close group of fixtures. However, unlike a trunk and branch layout, this layout can work well with recirculating pumps and on-demand water heaters. Additionally, if modified with branch lines that are small in diameter and longer to hold a higher volume of water, you could have a high flow rate that delivers water quickly and wastes only a small amount of water. Finally, the last common layout seen in water supply plumbing is known as a Home Run layout. This layout eliminates the need for inline fittings, reducing pressure losses along the lines and allowing the size of the pipe to be reduced. A Home-Run layout consists of one large, main water line that feeds into the manifold and branches off into smaller lines to each individual fixture. This layout allows you to shut off any one fixture from the manifold, which can come in handy if you find yourself doing a task that involves shutting off water to that location such as replacing a toilet or faucet. Additionally, because this type of system doesn’t rely on large pipes for distribution, you’ll find yourself saving water and energy. This layout is by far the most efficient, but it is also the most expensive of the three. 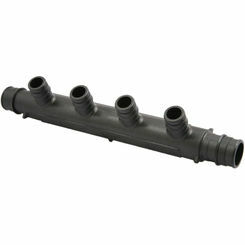 If you’re looking to revamp your current plumbing layout into something more efficient, the first step will be to purchase the correct trunk manifold for your layout. At PlumbersStock, we offer a variety of different trunk manifolds for whatever layout you’re looking to create. From an 8-port 1/2-inch PEX Manifold to a 4-port 1/2-inch PEX Manifold system, you’ll find whatever you’re looking for with us at the lowest price. See why so many others choose to shop with the plumbing experts as you take advantage of our low, wholesale prices from top manufacturers WARDFLEX, Sioux Chief, and Clayton.